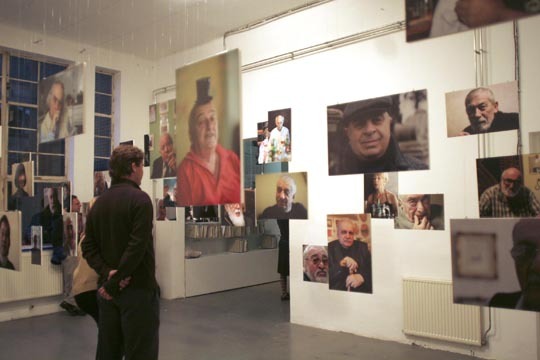 In her photo Installation Nino Purtskhvanidze displays portraits of famous people active in the Soviet Georgia during the communist regime. In her project she investigates the period that followed the crash of the Soviet Union that caused the loss of the joint cultural identity which everybody was part of. During the past ten years, everything has changed directions numerous times, and politics were no exception. These people are now old and no longer famous. They have been forgotten and disappeared. Society became fragmented. People started taking sides. Many people have moved away. Nothing was created in the 1990s. Many people were unable to find their way in this new context. Now they encounter many questions in different fields. Was everything they did worthless? Through her project Nino Purtskhvanidze tries to delve into this period by creating her own setting to display the heroes of Stagnation.